Despite Don doing his homework beforehand, we were still able to surprise him with some fun questions in the latest PiAchiever video. From forbidden fruit to Black Labs and coffee - we cover it all with this Marketo master. Watch the video above and don't forget to stay for the outtakes! Digital Pi: Today on PiAchievers, we have Don Le. He's going to talk about marketing operations at Ruckus. You ready? Do you know the format? Don: I'm ready, rock and roll. I saw some videos. I cheated a little bit. Digital Pi: He cheated! First one, what is your least favorite food? Don: I love all kinds of food. However, durian is my Achilles’ heel. Durian, the fruit spikes. Digital Pi: You guys know what that is? Don: There's a reason why they're spikes on there, not meant to be eaten. Digital Pi: All right, stay away. Don, next question. Who's the dog in the Ruckus logo? Don: I don't know who the dog is in the Ruckus logo. Its black lab and I just kind of adopted it- that's all I got! Digital Pi: It's a pretty cool dog, and now he's everywhere! Next question. We talked about what you don't like to eat but what's the weirdest thing that you have eaten? Don: The weirdest thing I've ever eaten is, I forget the official term of it, but it's weasel bean coffee. Have you heard of that? Digital Pi: Nope, that is weird. Next question: You have a great job now running operations at Ruckus but, if you could do another job for a day, what would that be? Don: An executive chef at a Michelin restaurant. Digital Pi: I like that, what are you going to cook? Digital Pi: Best vacation that you have ever been on? Don: My mother country is Vietnam. I love just learning about the history of my people, the food, the culture, and I travelled with over 15 relatives, aunts, uncles and cousins and we just had a great time there. Digital Pi: That's amazing! What's your secret talent or something that people don't know about you? Don: It's a guilty pleasure here, but I consider myself a video gamer. I love just playing video games all day long and first person shooters, but at this day and age, I just kind of keep it in the closet. Digital Pi: We got time for one more. What is the coolest thing about living in the Bay Area? Don: Living in the Bay Area is the sun; you got to have the beaches, the wine country, the city. Everything's within a 20 to 30 mile radius quite frankly. 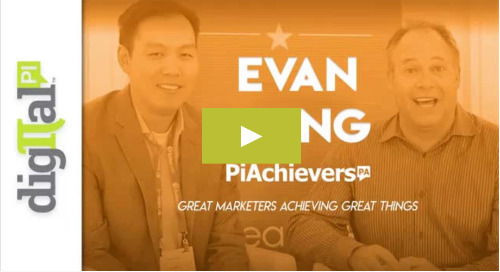 Digital Pi: Thanks so much for joining on this version of PiAchievers and we'll see you on the next edition. In this weeks PiAchievers we spoke with Heidi Bullock of Engagio. After using data to her advantage at Marketo, she's brought that data-driven mentality to her team at Engagio and hasn't looked back!